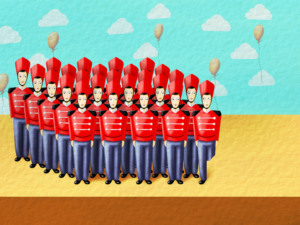 “Tin soldiers!” exclaimed a little boy, who had just been given his birthday present. He opened the box.Twenty-five tin soldiers were lying there as still as the lead they were made of. 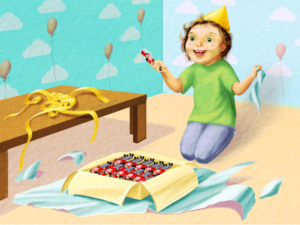 The boy clapped his hands together in glee and started arranging the tin brothers on the table. Twenty-four of the soldiers looked exactly the same, but the last one, the twenty-fifth, was missing a leg, because there hadn’t been enough lead to finish it. This last soldier stood just like his brothers all day and all night long. The only difference was that he only had one leg. Night came and the tin soldier could finally take a look at the other toys. They were carefully organized and each had its own place. His eyes fell on to a paper ballerina, who was also standing on one leg. The other was elegantly stretched up nearly to her head. The tin soldier couldn’t see the second leg and thought she was just like him with only one leg. He fell in love with the little dancer, whose top was covered with tiny stones, which flickered magically in the moonlight. “Hey, you there! You on the left!” yelled a green-haired troll from across the room. The tin soldier couldn’t understand who he was addressing, but the troll spoke again, “Take your eyes off the ballerina right now! Haven’t you seen a ballerina before?Don’t you even think of getting any closer to her tomorrow when the boy plays with us.” But the tin soldier didn’t pay any attention to what the troll was saying. 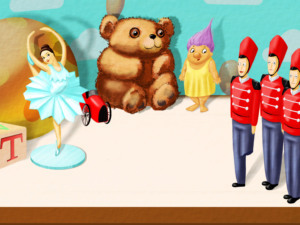 The next day the boy started playing with the toys and for a moment the tin soldier was so close to the ballerina that he thought he would have the chance to introduce himself. But the next moment the boy put him on the window to guard it, as it happened to be one of the main gates to the city. 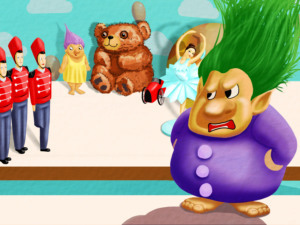 No one knows whether it was the wind or the troll who pushed the tin soldier out of the window, but what he knew was that he had fallen onto the street from the third floor and he couldn't move or ask for help. “A soldier in a uniform cannot ask for help,” he thought. Not long after, the tin soldier saw two boys.The boys also saw him and decided that a soldier like him couldn’t be left upside down in the street. 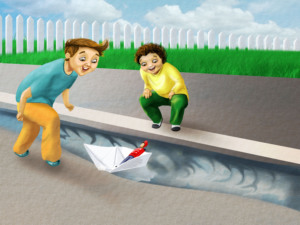 They made him a paper boat and set him sailing in the gutter. The boat sailed past streets and houses that the tin soldier had never seen. Then it was sucked into the storm drains with the tin soldier clinging on inside it. 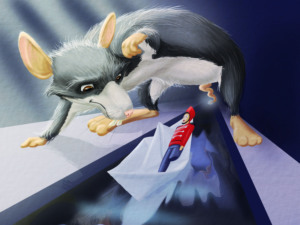 Just as he thought that nothing worse could happen to him, a huge rat appeared. ‘Pay me a toll to get through!” the rat shouted at him, but the water was faster than the rat, and the soldier whizzed past. He sailed on, but his ship disintegrated in the water. 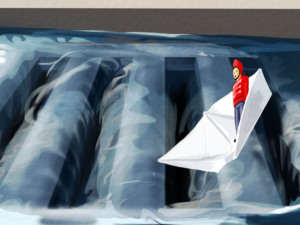 The tin soldier kept on travelling without his boat. 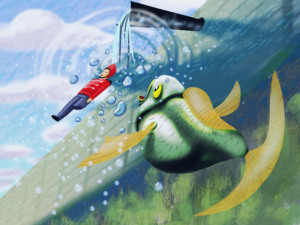 Later he would realise that he didn’t need it anyway, because the water from the channel flowed into a river. At the same time, a fish was quietly swimming down the river, minding its own business. He noticed the tin soldier and gulped him up at once. This was when the tin soldier started losing any hope of ever seeing the ballerina again. Luckily it was the season for fishing and fishermen were waiting around every bend. One of them caught the fish which had the tin soldier in its tummy and went to the market to sell it. 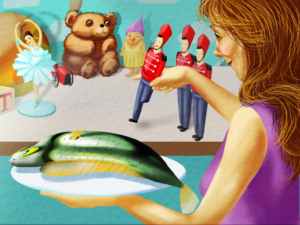 When they opened the belly of the fish, the tin soldier found himself in the house he had fallen out of! After he was carefully washed, he once again stood happily on the table top in front of the ballerina. Unfortunately, his happiness lasted no longer that a few seconds. 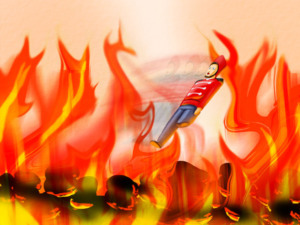 The boy was angry at the tin soldier because he thought that the soldier has deserted his post and so he took the tin soldier and sent him right into the fire. 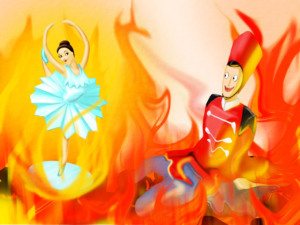 Just as the soldier had started feeling the heat from the fire, fresh air rushed into the room and the ballerina was blown into the fire with him. The tin soldier man was happy to see her again, even thought it was a short glance. After that, only her sequins were left to shimmer. The tin soldier followed her and melted in the heat, looking at the glittering sequins. 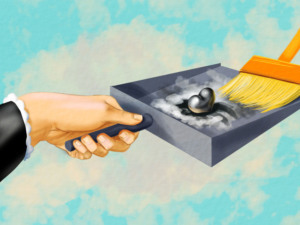 The next morning the maid took the ashes out of the stove and found a small tin heart in the ashes.